The market of the boat, to date, has offered solutions to cabin cruiser or semi-cabin only for very large boats. The minimum length for a cruiser boat was about 7 meters till now, with numerous problems associated with the size, both in launching and recovering, and in transport. If we added also the high purchase prices and operating costs, it get a very difficult business, because it often forces the owner to move in a relatively small space marine. By contrast, the cabin or semi-cabin boat with semi-rigid hull, even if it’s “portable” on the trailer, always has limits of weight, for both towing and launching in port, with the relatives difficulties and of the costs of the case. Both boats cruisers and other semi-cabs ships are often left in the harbor, where they remain exposed to the elements and the ravages of time. The Cabin56 offers an innovative solution in only 5.60 meters. It combines the peculiarity of the cruiser boat with the basic features of the inflatable boat: safety, speed, lightness and maneuverability. • Its characteristics permit to use it as any boat under 6 meters, but with the priceless comfort of the cabin: comfortable couch away from “bad weather”. • Its measurements make it ideal for rental in port or on the beach, for camping, hiking, fishing, diving, even in winter. • It can be put easily in water and it can be easily carried onto a truck of medium capacity. • This permits easy maintenance and does not require any storage. • Its low height, equal to that of any other boat of the same size, can easily keep it covered when not in use, saving on the ownership costs. Reserves of fresh water, removable table, tent and other accessories for maximum customization. Utilizzabile come un qualunque gommone sotto i 6 metri, ma con l’impagabile comodità del semi-cabinato. Misure ideali per il noleggio in porto o in spiaggia, il campeggio nautico, le escursioni. Carrellabile e non rende necessario il rimessaggio abbattendo così i costi di gestione. 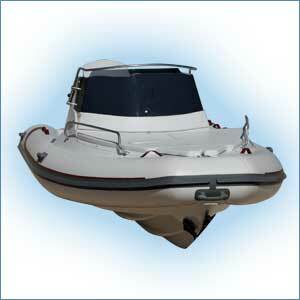 It can be used like any boat under 6 meters, with the priceless comfort of a semi-cab boat. It has got the ideal size to be used for hiring, in port or on the beach, for nautical camping, boat trips. It’s very trailerable, so it permits to reduce the costs of the service and the storage.